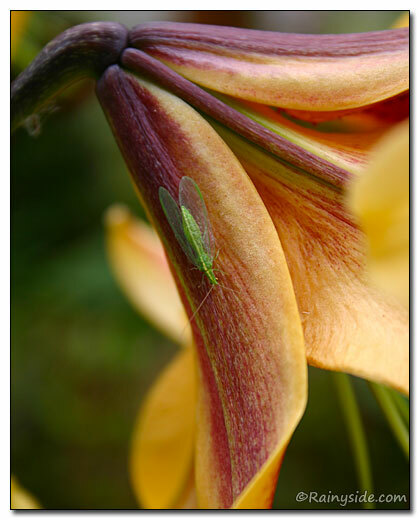 I was photographing a lily (Lilium 'Alchemy') and spotted our beautiful green lace wing. A lion in the bug world, the insect eats aphids and other pests. Even more hungry are the green lacewing's progeny. I always love it when I see these wonderful creatures, which are so delicate-looking yet ferocious predators. I photographed this bug-of-the-day, instead of doing my work. The side view shows its gossamer-like wings. I loved how it moves its antennae around—one forward and one backward. Oh my gosh, Debbie, what amazing photos! I love these delicate looking but fierce aphid eaters. I remember the day I discovered a string of eggs along the stem of a bleeding heart. I was so delighted! I remember when that happened because you posted it here. You was like one proud mama! I love those colors. What a great photo. I love Lacewings--they are truly beautiful, as well as beneficial! Nice pics, Deb. 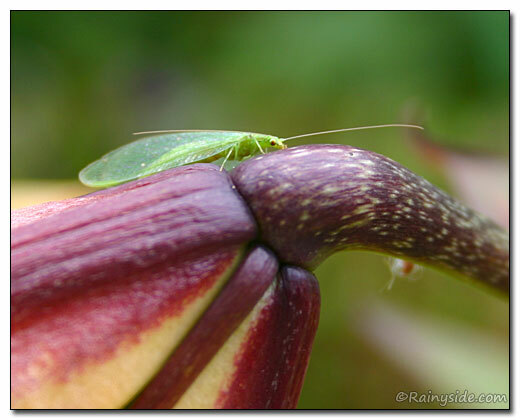 Nice of the lacewing to pick a lily in a contrasting color, to show up the color just right! "I loved how it moves its antennae around—one forward and one backward. " That was so he could get better reception. Time well spent, Deb. Very cool!